Happy Thursday! So… Love Island!!! I mean wow, I am really enjoying it. For my first time watching it, I’m just getting so into it! I even downloaded the Love Island app on my phone! I love that as soon as 9:00 pm comes around, literally the whole of Twitter is just tweeting about Love Island! I think my favourites are definitely Alex and Niall. Who are your favourites this year? I’m looking forward but also nervous at the same time to see what happens now they have brought two new people in to show. I really want Alex to stay and find love. In other news, I went to the cinema today with my best friend to see Deadpool 2. What a great film. I really enjoyed the first one, so I was super excited to go and see the new one today. If you’re wondering what film to go see at the cinema, definitely recommend seeing it. What have you been up to this week? Looking to decorate your home? Today’s brand new blog post is in collaboration with Wallsauce. If you are looking at decorating your home, or you love looking at home inspo pics, then this is the post for you. I am just completely in love with and swooning over these gorgeous and beautiful wall murals by Wallsauce. Above and below are just a few of the wall murals in which they sell and the ones that really got my attention. I think what I love the most about these murals, is that they can be the whole length of your wall. So like me, if you love being at the seaside, but live in a town inland, then you could get a seaside themed one, pop on your wall and it’s just like being right next to the sea. Or maybe you love fairytales. One of the pics I have included in the collage below is a gorgeous fairytale castle and setting with unicorns and looks so magical placed on a wall. 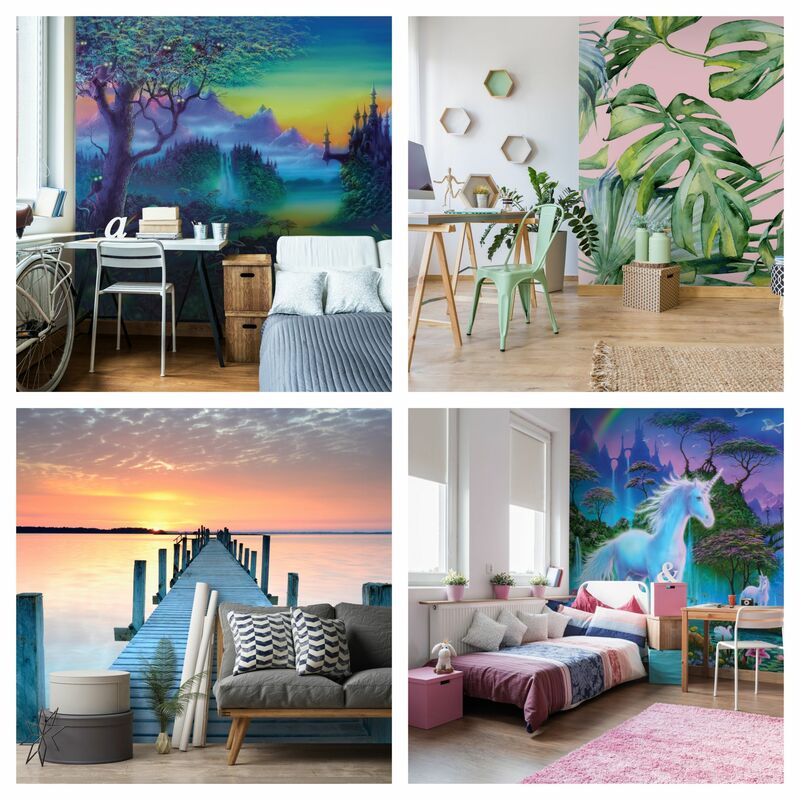 Wallsauce creates and supplies wall murals worldwide, with lots of stunning ones to choose from, from their designer range, or you can upload your own image and create your very own custom wall mural for your home. There is a choice of quality wallpapers to choose from including peel and stick. These will definitely add a pop of colour to your home. They are made to measure and there is also a new range available by photographer Anthony Bryant, they are definitely worth checking out. A few other personal favourites of mine are the flamingo murals, I just absolutely love them! I love flamingos! I was so happy when I was contacted to collaborate with Wallsauce, because I really really love looking for inspiration for my bedroom. I even have a home inspo board on my Pinterest with lots of ideas on, so this collaboration has come at the perfect time. There is literally so many to choose from. For example, there are even planes and vintage spitfire murals to choose from. My dad would absolutely love them ones. If you’re looking to decorate more than one room in your home, there’s something for everyone. Maybe you like pineapples!? There are pineapple ones too. Why, there are even murals for cat and dog lovers and all other kinds of animals! Decorate Your Home With Wallsauce. I am a huge fan of marble backgrounds, it’s one of my favourite things to take photos on for my blog. 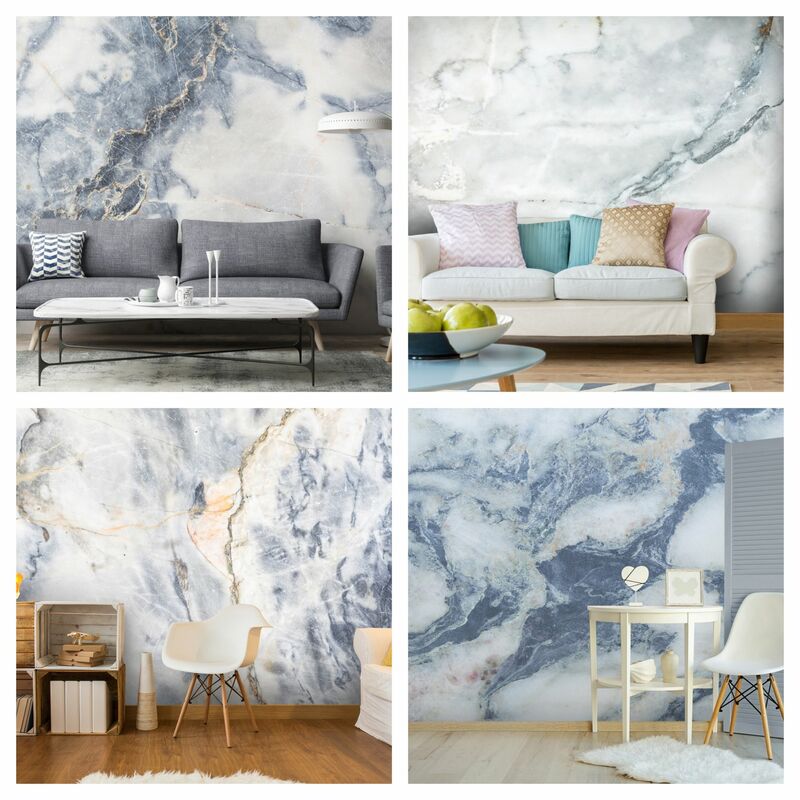 But what if you had your very own marble wall mural. I mean, how amazing would that be?! You could use it as a background for your home inspo pics or even your fashion pics. The wood effect wallpaper murals would also be perfect for this too. I think that’s another thing what I love the most about these, they are perfect to use as a blogger, for photos. And of course that they make the room look so gorgeous. Eek, I’m getting so excited just thinking about all of the possibilities of these murals for decorating the home! The book lover in me is just adoring the bookcase wallpaper murals. I just want to place one on my wall and re-enact the scene from Beauty and the Beast with Belle and her bookcase! You can find the source for these images here.